The Pollination State indicator displays the current pollination state of a plant. indicates that the plant has not yet produced any pollen, as it has not reached full-grown level. indicates that the plant has entered its pollen producing state, and can have pollen gathered from it, or be cross-pollinated to. indicates that the plant has been pollinated (either by itself, through natural self-pollination, or by the pollen of another plant). While you can still gather pollen from a plant in this state, the plant can no longer be the target of cross-pollination. – Plain, black and white seeds are all dull colored. – All other colors come in dull and bright versions. – Brightness of the child is determined by the color of the parents. – Brightness of the parents does not influence brightness of the child. – Crossing two different colors yields a dull color. – Crossing two identical colors yields a bright color. – All colors except plain, black and white come in dull and bright versions. – There are three primary colors: red, blue, yellow. – There are three secondary colors: purple, green, orange. – Crossing two identical colors will give that color. – Crossing two different primary colors will give a secondary color. – Crossing a primary and a secondary color will give a primary color. – Crossing two different secondary colors will give a primary color. – Crossing plain pollen with any other pollen will give plain pollen. – Four rare colors have been introduced with the “Naturalist Quest”. – The rare colors are pink, magenta, aqua and fire red. – Five different Bonsai Seeds have been introduced with the Samurai Empire Expansion. – Both the rare colors and the Bonsai Seeds are considered mutants and give no seeds. To determine what plant will be the result of a crossing, take any two plants displayed below and find which other plant is exactly halfway between those two plants, horizontally, vertically or diagonally (right to left). That will be the offspring. Example: Exactly halfway between the Fern and the Tribarrel Cactus you will find the Water Plants, which will be the result of crossing the two plants. Also, to determine how to crosspollinate to any displayed plant in the grid: Start in the cell of the plant you want to create. 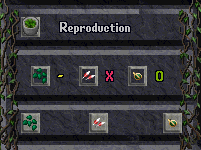 Move one or more cells away horizontally, vertically or diagonally (right to left), and the same amount of cells in the opposite direction to find two possible parents of that plant. Example: To create Snowdrops, you can cross either Poppies and Bulrushes, Campion Flowers and Lilies or Snowdrops and Snowdrops. Where plants have an even number of grid squares between the resulting cross has a 50/50 chance of being either of the two central plants between. Note: To the right you can see the Century Plant full size, it is shown smaller in the table below. maby my eyes are just going bug eyed trying to figure this out but i would like to present a set of crossings maby you will be able to tell me if it adds up right. Sorry this reply might be a little late. They’ve added a few new plants now. It seems crossing cactus doesn’t get you what this chart says it will anymore. But, for the most part it’s right. If you have an even number between the two plants you are crossing, in your examples the fern + pampas grass, you have a 50/50 chance of getting either the rushes or an elephant ear. So I’m really new to gardening and am trying to figure this out… what about plant combinations where there’s not an exact halfway point, like, say, a fern and a snake plant? I’m not sure if it would be a small palm or a century plant. Where plants have an even number of grid squares between the resulting cross has a 50/50 chance of being either of the two central plants between. Example Pampas Grass plus Fern or Lilies plus Ponytail Palm have a 50/50 chance of producing either Rushes or Elephant Ear. great chat but ive the crossings down the right hand side using the fern tried all but the first 2 and i didnt get any of the plants that it said i should ether the seeds are bugged or they dont use that crossing any more. so far i have found 16 different types of plants droping off the boglings and bogthings in the colors of red blue yellow and plain. i have yet to try all the crossing on this chart yet but plan to do so but so far nothing has been lining up except the color crossing. but i wind up with a completely different plant then the chart says. Not sure on how you are going about the crossings. Remember that if you cross a fern with a Tribarrel Cactus for instance you should get a water plant. The table works by whatever plant is halfway between two others is the result of a cross. So fern and small palm should get a ponytail palm.